Meg Rosoff can’t let caring dogs lie, it seems. 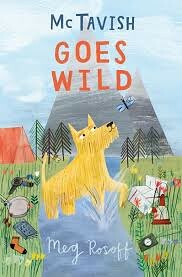 After Jonathan Unleashed, where his canine flatmates made sure Jonathan was all right, she unleashes McTavish on younger readers in Barrington Stokes Conkers imprint. The Peachey family have discovered that mothers are the best. They do most of the work, after all. But when Ma Peachey has had enough, something has to happen, and after some initial domestic mayhem, the remaining Peacheys decide to get a dog. Luckily they find McTavish, who’s prepared to take them on, despite them not being ideal humans for an easy – dog’s – life. What to do about the laundry mountain, the shoe mountain and everything being in the wrong place? Getting out of bed on time?And when that’s fixed, there’s the cuisine. A dog can only eat so much pizza. McTavish has many plans, and believe me, they are necessary. But sooner or later a firm paw will work wonders on a misguided family. 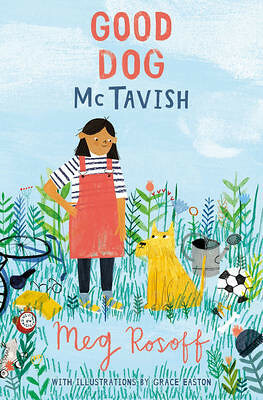 I foresee a run on rescue dogs after children – and maybe their adults – have read Good Dog McTavish. Not by me, obviously. Here at Bookwitch Towers we are virtually perfect. Especially me. But needier souls will want a McTavish in their lives.